There is definitely a pervasive belief that midsize companies simply can't afford, can't handle, or can't appreciate business intelligence (BI). I even run into executives at midsize companies who absolutely believe that companies the size of theirs don't need BI and can't benefit from it. It simply isn't true, and in this chapter, I'm going to play "Mythbusters" and address the most common misinformation regarding BI as it relates to these companies. (CRM), accounting software, payroll software, or any other common business tool. Although it's true that many of these technology solutions began in extremely large companies, the fact is that any company can run itself more effectively and efficiently when these tools are available. It's also true that the CRM solutions (to take one tool as an example) used by giant enterprises are built differently than those used by midsize companies, but that doesn't mean midsize companies don't benefit from their particular versions. In fact, that's one of the common themes you'll find in this chapter: Midsize companies can and do benefit from the same business tools and capabilities as giant enterprises; those tools are simply built specifically for the midsize market, and are often easier, less expensive, and faster to adopt and use than the ones designed for giant enterprises. On to the myths. I find that there's definitely a belief that BI can be disruptive to the business, or at least that the process of implementing BI can be disruptive. I've certainly worked with customers who have had dedicated project teams work for many, many months at bringing a BI project to light, and the entire process certainly was disruptive to the business in many ways. But those were gigantic companies, and many of the problems they dealt with were ones you'd only run into inside a really large enterprise. Let's focus on some of the major aspects of the "disruptive" myth. One objection I hear from midsize companies is that they fear they'll need to purchase expensive tools, and undergo extensive training, in order to begin planning and deploying a BI solution. It's easy to see where this "myth" comes from—because I can confirm that it really does happen—inside huge enterprises. But this is hardly true only with BI projects. Look at nearly any major, enterprise‐wide project in a massive company and you'll typically see the need for specialized tools, extensive training, and so on. How many major companies haven't been through an exhausting implementation for accounting software? I remember when one past employer—a 22,000‐employee telecommunications division—implemented new financial software and "specialized tools and training" was an understatement. Horror stories abound for CRM and Enterprise Resource Planning (ERP) solutions, as well, and I've seen those projects (in one case I got roped into one). There was a ton of specialized tools and training floating around. But again, that was in a very large company. Here's why: Large companies tend to be extremely diversified. They have a lot of things going on, and they have departments and divisions that operate almost as autonomous businesses. Simply figuring out what an accounting system needs to look like or how a CRM solution needs to work requires some very specialized experience. BI is probably an extreme example of this: A truly enterprise‐wide BI system wants to touch every piece of data the company has so that all that data can play a role in dashboards, reporting, analysis, "what if" scenarios, and so on. Figuring out where all that data lives, who owns it, how it works, and how it will be loaded into a data mart or data warehouse are complicated tasks. The tools used to design the resulting data warehouse are complicated and can be expensive; the tools used to gather information and requirements are equally specialized. But that's in a very large company. So if "specialized tools and training" are a truth for large enterprises, why are things any different for a midsize company? I don't want to come across as suggesting that midsize companies are somehow more generic than larger enterprises, because that isn't true. But the fact is that most midsize companies do operate by a more common set of rules and practices than large companies do. That isn't a downside of being a midsize company; it's a benefit that most large enterprises often wish they still had. Bear with me for a moment while I explain. Start by considering payroll. Most midsize companies have fairly basic and common payroll needs: You pay employees, you keep track of paid time off, you account for tax withholdings, and you likely extract some money for benefits. No matter what line of business you're in, payroll tends to look the same—so much so that midsize companies often outsource their payroll entirely or use off‐the‐shelf software packages that all work the same way. Midsize companies don't often have a massive cadre of HR folks, and so those companies tend to keep their payroll within the realm that can be handled by outsourced companies or by off‐the‐shelf payroll packages. When you get to be a huge company, however, and you build up a huge HR department, it starts to be easier to do different things with payroll, and so payroll becomes almost a side business within the enterprise—specialized to the enterprise's needs. What about accounting? Midsize companies tend to follow Generally Acceptable Accounting Practices (GAAP), and there are numerous off‐the‐shelf software packages that provide perfectly acceptable accounting capabilities. Midsize companies do accounting because they have to, not because they especially enjoy it; therefore, they tend to keep their accounting practices within the domain that an off‐the‐shelf (or lightly customized) accounting package can handle. Sure, midsize companies could start doing complicated things with accounting, and they'd save some money—but they wouldn't save enough to make it worth the extra complication. Large companies, however, can see bigger savings from more complicated and detailed accounting practices, and so those large companies invest in specialized software, specialized processes, and so on. This same trend continues through just about every business tool: Midsize companies could have the same level of complexity as a giant business, but there's not a huge return in doing so. Therefore, midsize companies tend to have back‐end systems that all look and work in a very similar way. Those systems, to a degree, drive (or at least influence) the company's business processes and workflows, meaning that most midsize companies look—from a back‐end perspective—if not identical, then at least very similar. There's an important truth here that I want to emphasize: Midsize companies often steer clear of very customized tools and processes because those customizations add complexity that are not justified—to a midsize company—in terms of their added value. So how does this affect BI implementations in a midsize company? The reason a massive enterprise needs specialized BI tools, skills, and training is because every single massive enterprise looks entirely different from the others. They've all adopted their own customized accounting, payroll, ERP, CRM, and other practices. Designing a BI infrastructure that utilizes all those data sources will, obviously, be a customized undertaking and will require specialized skills, tools, and training. A BI solution designed specifically for midsize companies still requires specialized tools and training, but because midsize companies look so similar on the back‐end, those specialized tools and training come into play once, when the BI solution is initially created by its vendor. After that, the same pre‐made BI solution will—with perhaps some light customization—be suitable for most midsize companies simply because most midsize companies are using the business practices and patterns that were taken as assumptions when the BI solution was created in the first place. In other words, a midsize company can do without the specialized tools and training simply because a midsize company will tend to steer clear of the customizations that make the tools and training necessary for an individual BI deployment. This is an important concept for debunking many of the BI myths in this chapter, so I appreciate you bearing with me through this explanation. Let me try and wrap it up with a non‐business analogy, just to make sure I've made this important point. Consider a NASCAR car. That car requires some expensive, specialized tools, and its driver requires extensive, specialized training. Why? Those tools and training can bring the hundredths‐of‐a‐second advantage that means a win. Most normal drivers—like you and me—don't need a hundredths‐of‐a‐second advantage, so we make do with cars that don't need highly‐specialized tools. That means we can very feasibly purchase and own a car without having any specialized tools or training. The cars we buy are designed to work in a standardized fashion, even though the cars available to us vary widely in specific features and capabilities. That's basically why midsize companies don't need specialized tools and training to do a BI implementation: Pre‐packaged solutions that are designed for the way most midsize companies already work have the specialized tools and training built right in. I was on a BI project in a 40,000‐employee company that took 2 years to complete. No kidding. We spent the first 9 months on requirements gathering, something like 3 months designing reports and data warehouses and such, and a year on the actual production implementation and the inevitable, "oh, can it also do this?" requests from the system's users. Why so long? Well, it was a huge company. Data was everywhere, and we had to reverse‐engineer how the company worked in order to build an effective data warehouse. That's kind of a worst‐case example, but it serves to illustrate the point that BI can take a very long time. In big companies. I won't belabor the point I made in the previous section any further, except to say that because most midsize companies use similar back‐end tools and processes, it doesn't have to take nearly as long to implement a usable, effective BI solution in those companies. Sure, this still isn't a case where you double‐click Setup and are done—but it's closer to that than the implementation that giant companies undertake. In many cases, prepackaged midsize BI solutions are "all in one" packages. You install a single piece of software and you get a place for a data warehouse, Web server, data‐loading components, in‐memory analytics, reporting, dashboarding, and everything else a BI system needs. You just point it at your existing business data and let it go to work. I've seen implementation times of a few weeks or so, using the existing IT staff. Some companies might be able to get a BI solution up and running in even less time, especially if the solution is initially only addressing a single division or department within the company, simply because that means fewer data connections that have to be made. I think the first two pieces of this myth pretty much handle this third one. If midsize companies can implement a prepackaged BI solution in a few weeks, using their existing IT staff, and without having to offer extensive training to half the company employees, well, then the BI implementation isn't going to be very disruptive. Most of the "disruption" in a large‐scale BI deployment comes from the discovery and requirements‐gathering phases, where BI project team members invade every corner of the company trying to figure out what data lives where, how everything fits together, and so on. The IT staff gets distracted with new hardware, complicated new software, complex data connections, and so forth. With a prepackaged BI solution, there's simply no opportunity for any of that to occur: You don't have a months‐long discovery and requirements‐gathering phase, and the IT staff is usually dealing with a single, simpler piece of integrated software that's much more within the scope of what they're used to dealing with. When I talk to executives in midsize companies, I think the first and loudest objection to BI is the belief that the company is going to have to hire a cadre of specialized (and expensive) consultants to make BI happen. That's certainly been true in many large companies I've worked with, mainly because their IT staff lacked the specialized skills it takes to plan and implement a data warehouse and other BI elements. Even after the main implementation is over, consultants and trainers usually stay around for several months teaching the company's executives, managers, and other users how to operate the BI solution—and in some cases, I've seen some consultants turn into full‐time employees, specializing in BI and in helping the company's users take advantage of the system. But midsize companies don't need to deal with that. Here's another analogy: Consider two companies that build homes for a living. One company only builds custom homes that cost millions of dollars; the other builds homes in master‐planned communities and charges a few hundred thousand dollars. Both companies build great‐looking homes, and they use many of the same raw materials. They're also held to the same building codes and other practices, and they both believe in creating a highquality product. When the first company begins architecting a new home, a lot of specialized tools are required. Architects have to draw every aspect of the new home, and engineers have to figure out the roof structure, load‐bearing capacities, and so on. Because their customers are paying huge sums of money, every job is completely customized, and so the architects and engineers get involved every time. The company's customers all lead wildly different lifestyles: Some want in‐home recording studios, others want massive multi‐car garages, and so on, so all that customization is really a big part of the business. The second company's customers don't want to spend millions on a home, though. So the second company offers a few pre‐designed floor plans, all of which have been architected and engineered in advance. These aren't cookie‐cutter homes; the builder understands which walls are load‐bearing, for example, and can do minor customizations that don't affect the pre‐engineered structural integrity. This company's customers don't demand a high level of customization—for example, they simply want to pick out their cabinets and countertops. Because these customers don't want or need designed‐from‐scratch homes, they save themselves the expense of an architect and engineer. It's not that those specialized skills were never needed; they were simply only needed once, and the results of their work will be used many times, by many different customers. This "one time engagement" of specialized expertise is what debunks this myth for midsize businesses. Let's look at some specifics. Although a pre‐engineered midsize business BI solution isn't exactly as simple as "double click Setup," it is, as I've already mentioned, not a lot more complicated than that. At least, it's certainly not as complicated as designing a whole new BI solution entirely from scratch. Deployment and implementation does start with double‐clicking Setup, often installing a completely integrated, one‐piece (or few‐piece) solution that contains pre‐built BI components such as a data warehouse, reports, and so on. Deployment and implementation is about the same complexity level as deploying and implementing any other server software, such as a database server or messaging server. The most complex part of the implementation is often the part where you connect the BI system to your other business systems. Typically, prepackaged BI solutions offer "wizards" and other tools to help make this process easier. Prepackaged solutions may even come with built‐in "connectors" for common midsize business back‐end systems, such as accounting software, ERP systems, CRM systems, and so forth. So although this isn't a "no brainer" part of the BI solution deployment, it's certainly something that the average IT staff can handle—without highly‐specialized skills. There's also a concern that midsize companies don't have the necessary skills in their existing IT staff to manage a BI solution on an ongoing basis. Fortunately, that's not generally a concern. In fact, even some extremely large enterprises get away with very little in the way of specialized technology management skills. There are two aspects of managing a deployed BI solution. The first is the simple, basic, day‐to‐day operational stuff: keeping databases tuned for performance, backing up servers, keeping servers properly patched and updated, and so forth. This kind of maintenance is something any normal IT staffer should be able to handle; the most complicated maintenance task—database tuning—is frankly something that can be more or less set up once and then scheduled to run automatically; prepackaged BI solutions typically have this built‐in and are advertised as "self‐maintaining." The other aspect of BI solution management is ongoing customization. Big companies change their patterns and practices over time, evolving their business. Some large enterprises make sweeping changes fairly often—and feel the operational pain when all their systems, including accounting, ERP, CRM, and so on, need to be updated to reflect the changes in the business model. For those companies, having specialized IT skills on staff is a cost of doing business. Plenty of huge companies, though, make relatively few changes to their basic patterns and practices. They don't want to re‐architect their accounting records, re‐design their CRM solutions, or re‐design their BI solution. So those companies, even though they're quite large, often do without specialized BI skills on staff. Midsize companies also tend to avoid the kind of complex changes that require sweeping changes to their back‐end systems. Remember, midsize companies often steer clear of very customized tools and processes because those customizations add complexity that is not justified—to a midsize company—in terms of its added value. Some midsize companies are fortunate enough to have BI experience on‐staff. Typically, it's in the form of an IT staffer who perhaps worked on a BI project in a previous job—often with a large company. Or it might be an executive or manager who used BI solutions in past jobs. The fear, however, is that those large‐company skills won't scale down to the midsize business, meaning those existing skills are at best useless, and are at worst dangerous, as they will drive big‐company decisions that aren't appropriate for a midsize business. In my experience, nothing could be further from the truth. I've spent a lot of time writing about prepackaged BI solutions for midsize companies; it would be very easy to assume that "prepackaged" somehow means "different" or "less capable." Not so. Prepackaged BI solutions are BI solutions; they work in much the same way that big companies' BI solutions work, and past experience with any BI system will make someone more comfortable with any other BI system. "Prepackaged" simply means "assembled for you" rather than "build it yourself;" custom‐built BI solutions are custom, not necessarily better. So large‐company skills don't need to "scale down" to midsize businesses; those skills are valuable exactly as they are. Do BI systems require specialized end‐user skills? Well…yes and no. This isn't a case where I'm going to tell you—again—that midsize companies simply don't need the same skills as big companies. As I outlined in the previous section, big‐company BI skills work well in a midsize environment; that suggests that any BI implementation will need the same skills, so someone who doesn't have those skills will need training. Right? Again, yes and no. Let me fall back to the example of accounting systems. In the very earliest days of computerized accounting systems, computerized accounting was only done by big businesses. A lot of specialized skills were involved; midsize businesses stuck with pencil‐and‐paper ledgers. As more and more big businesses used those accounting systems, however, the folks who created those systems found ways to make them easier to use. Eventually, that resulted in prepackaged accounting systems—like today's QuickBooks for small businesses, or Microsoft Dynamics for midsize businesses—that were easier to use and really didn't require a lot of skills specific to the software. Any competent accountant, accompanied by a good instructional book, could figure out the software and use it effectively. In other words, the investment by big companies made things more accessible to smaller companies. We see that again and again in the IT industry: Big companies were the first to invest in large, mainframe computers in the sixties; today, every company has several PCs. The same has held true for BI: The investment by big companies—in training their end users, in implementing BI, and so on—has made things much more accessible to end users. The first BI implementations relied on complex reports, proprietary analysis interfaces, and so on; today, Web‐based dashboards and scorecards are accessible to more users. Addins to familiar applications such as Microsoft Excel put BI analysis in the hands of more people, with less training. Big companies started with simple, information‐dense charts, like the one shown in Figure 3.1. Figure 3.1: Detailed BI chart. Although this type of chart is still useful today, it took the first BI users a good deal of time and effort—using specialized skills—to pull this information together into this display. 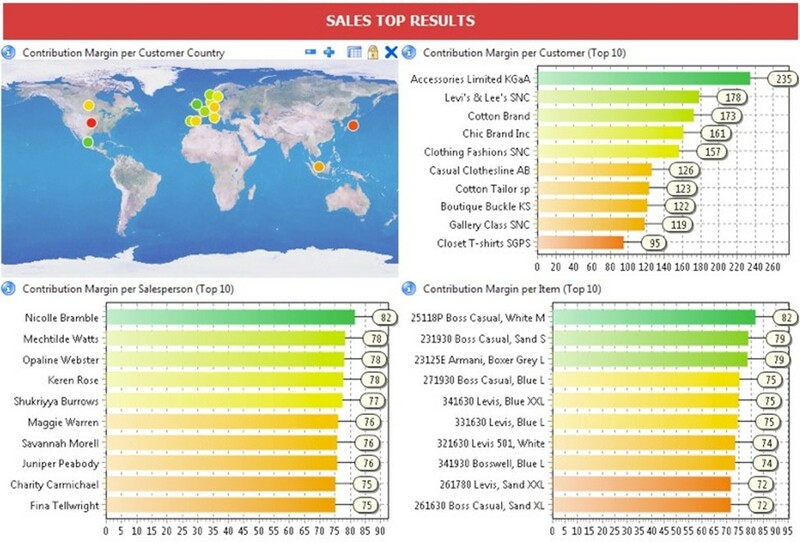 Today, BI solutions for both enterprises and midsize companies can automatically produce richer displays, like the sales dashboard shown in Figure 3.2 and the scorecard shown in Figure 3.3. Figure 3.2: Sales dashboard from a BI system. Figure 3.3: Example scorecard from a BI system. Again, the answer to this myth isn't the same "midsize companies aren't the same as big companies" answer I've provided up to this point; in this case, specialized end‐user skills are less needed by any BI system—large or small—simply because BI solution developers have made considerable effort to make things more intuitive, automatic, and approachable. We're simply seeing the culmination of more than a decade of continued progress and evolution. Now, that's not to say that big companies don't have end users who have specialized skills. If you're trying to answer entirely new questions using a BI system, then things will certainly go faster if you're experienced using your toolset. But in large part, I think the operative word there is experience. Any intelligent businessperson can gain "specialized skills" simply by using their BI toolset for ever‐more‐complex tasks. And "training" for these end users is also more widely available: Type "BI data analysis" into an online bookstore's search engine, and you'll find hundreds of results. When I've worked with big companies, there was no question that BI was a pricey proposition. But isn't everything in a big company expensive? That's part of the deal of being "big." But you can't use big‐company pricing to draw accurate conclusions about BI costs for midsize companies. Your midsize company didn't spend as much on, say, a CRM solution as a gigantic enterprise—why would BI be any different? There are two main costs associated with a BI implementation, and one of them is obviously the cost of the BI software. That is what it is, but a midsize company shouldn't expect to pay anything like what a huge enterprise would invest. The vendors that produce these solutions aren't stupid; they know perfectly well that they need to offer different price points for different‐sized businesses. Many of these vendors do so by offering different packages or "editions" of their solutions and toolsets. Just as Microsoft offers an "Ultimate" edition of their Office productivity suite, they assume only power users would purchase that edition. Other editions—"Home & Student," "Professional," and so forth—all provide different price points, and functionality packages, for users with different needs. Today, BI solutions aren't really that different: Your midsize company can get the functionality you need in an "edition" that's much less expensive than what a big enterprise would need and be willing to pay for. The other main cost associated with a BI implementation is the hordes of consultants who will spend months and months researching, planning, implementing, and training before your BI solution is officially online—in a big company, at least; as I've already discussed. Midsize companies can benefit from prepackaged solutions that require little or no consulting services. Sure, you'll probably spend some time speaking with a salesperson and a technical expert, selecting the right feature set for your needs, and making sure that the solution you eventually purchase will do what you expect it to. But in many cases, these prepackaged solutions are prepackaged in every sense of the word: You don't need to have a bunch of outsiders come in and install it for you. Notice I said need. You certainly can have consultants handle your BI implementation, and there are some valid business reasons for doing so, such as an IT staff that simply doesn't have time for the project regardless of whether they have the right skills. But with BI solutions targeted specifically at the midsize market, you'll find that even the consulting expenses—should you choose to use consultants for your implementation—are much lower than what a big company would expect to pay. You're looking at weeks of implementation, not months; you're dealing with a BI solution that's intended to be installed using fewer specialized skills (meaning less‐expensive consultants), in less time, and with less effort. Don't Like Negotiating with Vendors? There's another thing I find about midsize companies who are exploring BI options: They hate dickering with salespeople. There's this feeling, nowadays, that every business software purchase is going to be like buying a car. You have to haggle over the basic license pricing, then haggle over the maintenance fees. The salesperson is trying to figure out exactly how much he can squeeze before you kick him out of the conference room, while you're trying to figure out how low you can drive the price before the salesperson gives up and walks away. Some businesspeople love negotiating, and there will always be salespeople willing to do so. But some BI vendors—especially those targeting the midsize market—realize that a lot of midsize businesspeople don't have the time or inclination for protracted negotiations. They're buying a prepackaged solution, after all; why can't they pay a prepackaged price? You'll find that many BI vendors—again, especially those targeting the midsize market— provide simple, fixed pricing on their midsize business BI solutions. You're just buying a piece of software, not a piece of real estate, so they try to make things easy as well as affordable. Some BI vendors make their midsize business solutions available as a free trial download. To me, that says an awful lot about the myths we've explored in this chapter. A free download means the vendor is pretty sure you'll be able to set the software up and use it quickly (before the trial expires), and that you won't need specialized consulting services or skills in order to have at least basic success with the software. A free download means you're not expected to have any specialized planning or design tools, either. A free download is also a sign of software that is, or is on its way to becoming, somewhat commoditized. That's not to say that different vendors don't have competitive advantages, but rather to say that they've really gotten the software prepackaged, and that obtaining it and using it shouldn't be any more complicated that obtaining and using any other piece of server software. Plus, a free trial means you can often install and explore the software entirely on your own, at your own pace, and under your own conditions—you don't have to engage in a lengthy sales relationship just to see what the software looks like, what it does, and how it works. I find that midsize companies— especially their IT departments—really love being able to test something on their own, then engage the vendor's sales organization when they're ready to proceed. There are a few things that midsize companies can typically do with BI that is actually a distinct advantage, giving midsize companies a real benefit that is more difficult for larger companies to achieve. One example is in‐memory analysis. As I described in the previous chapter, it's a growing trend to use in‐memory analytics because they're fast, can often access more up‐to‐date (or even real‐time) data more readily, and ultimately because they provide faster answers to questions. They allow more rapid exploration of "what if" scenarios because you don't have to wait for reports or other output to be generated. Big companies can certainly use in‐memory analytics, but it can often be expensive for them (remember, everything a big company does seems to be expensive). Because their business models deal with so much data, they need a lot of computing power—especially memory—to make in‐memory analytics possible. Some big companies choose to live without it, while others make the investment. Midsize companies often deal with a smaller volume of data, meaning in‐memory analytics is more immediately approachable. Computer hardware costs the same no matter how big your company is, and a midsize company will often need much less of it to enable in‐memory analytics—a distinct advantage given the benefit in‐memory analytics can have on business decisions. Big companies are…well, they're big. They have lots of divisions with different needs, and that can make BI difficult. People wind up looking at different, customized reports, and drawing different conclusions from what they see. Another advantage of midsize companies is that everyone tends to be a little closer to the actual line of business, so everyone tends to be a little more consistent in their needs. Prepackaged BI solutions capitalize on this by making consistent BI output available across the business, in the form of reports, dashboards, and so forth. By getting everyone literally on the same page— something a midsize company can have an easier time doing—you can make more consistent business decisions and get everyone moving in the same direction more easily. Hopefully, I've convinced you that BI isn't just for big businesses, and that many of the common perceptions about BI are in fact misperceptions. BI doesn't have to be expensive, doesn't have to involve an army of consultants, and doesn't require your business to slam on the brakes and disrupt itself. But in using terms like "prepackaged," I may have given you the impression that midsize business BI offerings are somehow less capable or flexible, and I need to address that. Although BI solutions targeted at midsize companies often do include a subset of the features found in a "big company" BI solution, that's typically because many of the "big company" BI features are specific to a major enterprise environment and those features often do require the specialized skills and training midsize businesses are less likely to have or want to acquire. That does not mean that prepackaged, midsize business BI solutions are inflexible, "one size fits all" programs that will force you to change the way you do business in order to "fit" the solution's preconceived model. Modern software is, fortunately, much more flexible than that. Every BI vendor knows that they can't force you to remodel your business to fit the vendor's notions of how your business works. If they tried, you'd simply never by their product, and they'd fail. The value of BI can only be realized when the BI solution maps itself to your business model, not the other way around; that's why large businesses typically have customized BI solutions built for them. It's the similarity of midsize businesses that make prepackaged BI solutions feasible; nobody expects midsize businesses to be identical. BI solutions targeted at the midsize market can be incredibly flexible, and exploring a solution's ability to map to your business model is one of the first things you should do when evaluating solutions for your business. "Midsize" doesn't mean "dumbed down." Midsize business BI solutions typically include powerful, customizable reporting capabilities. A difference, however, is that these capabilities are typically exposed in a much friendlier, more intuitive way. BI data is often stored using a common metadata model that uses standard business terminology rather than tech‐geek‐speak, making the BI system more understandable to business users. Midsize BI solutions typically include lots of built‐in reports for the most common business needs, and these reports can serve as the basis for additional, customized reports that are shared—through a central repository—across the entire business. As users gain experience, they can usually begin writing their own custom reports, again sharing these through the BI solution with the other users in the company. Big businesses were among the first to invest heavily in mobile workforce technologies, and that investment—like all the others big businesses have made in IT over the decades— pays off for midsize companies. Having created "data everywhere" capabilities for their bigcompany BI solutions, BI vendors moved quickly to bring the functionality to their midsize business offerings as well. And any business can certainly benefit from "data everywhere." The popularity of mobile devices such as Blackberries and iPhones proves that business people love to be connected to their businesses all the time—and being connected to your BI solution is no different. Midsize business BI solutions can provide robust mobile support, including the ability to access reports, dashboards, and scorecards from mobile Web browsers, dedicated mobile applications, and even through mobile email (see Figure 3.4). The continuing improvement to mobile device Web browsers can make even more BI data available remotely, because—as I'll discuss next—many BI systems are relying more and more on Web‐based interfaces. Figure 3.4: BI solution being used from a mobile device. Mobile devices aren't the only part of "data everywhere" that you should look for in a BI solution. Simply being able to access reports, dashboards, and analysis tools from a home office, from a hotel room while traveling, or in the conference room of a business partner are all valuable usage scenarios. Most midsize business IT solutions accommodate these scenarios by standardizing on powerful, modern Web‐based interfaces for much of their reporting and analysis functionality. Figure 3.5 shows an example of a Web‐based analysis/reporting interface—something that users could access using any Web browser from any computer in the world. Figure 3.5: Web­based interfaces are accessible from anywhere. The next and final chapter in this book will outline a roadmap for successfully adding BI to a midsize company. Now that you've learned what BI is, how it works, and what isn't true about it, you're ready to see how to bring it into your company. I'll start by reviewing some of the main challenges presented by BI, and some ways in which you can address those challenges in a uniquely midsize company fashion. I'll look at ways to bring BI into the company without turning it into a giant, never‐ending implementation—and without breaking the bank. I'll show you how BI can be made to work within the scope of your current IT resources, without needing expensive consultants camped out for the next 18 months. Finally, I'll look at how to do BI in a way that complements, rather than disrupts, your business environment. I'll wrap up this book by explaining a few of the things that big businesses deal with when it comes to BI and how some of those things aren't good for midsize companies; I'll then show you how to avoid them.